As most long-standing news outlets have shuttered their foreign bureaus and print operations, the role of GNNs as information collectors and policy influencers has changed in tandem. Western GNNs are honored for being untethered to government entities and their ability to produce accurate yet critical situational analyses. However, with the emergence of non-Western GNNs and their direct relationships to the state, the independent nature of our global news cycle has been vastly manipulated. 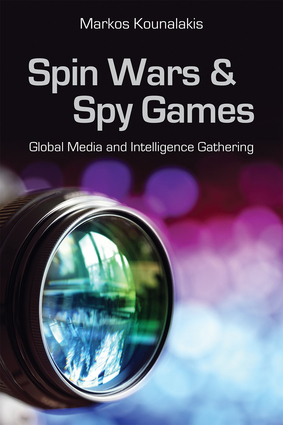 In Spin Wars and Spy Games, Kounalakis uses his interviews with an expansive and diverse set of GNN professionals to deliver a vivid depiction of the momentous sea change in mass media production. He traces the evolution of global news networks from the twentieth century to now, revealing todayâ€™s drastically altered news business model that places precedence on networks leveraging global power. This eye-opening narrative transforms our understanding of why countries like Russia and China invest heavily in their news media, and how the GNN framework operates in conjunction with state strategy and diplomatic sensitivity. Profoundly meticulous and insightful, this seminal work on the current state of transnational journalism gives readers a first-hand look at how global media powers shape policy and morph the publicâ€™s consumption of information. Markos Kounalakis, PhD is a visiting fellow at the Hoover Institution at Stanford University and a senior fellow at the Center for Media, Data and Society at Central European University in Budapest, Hungary. He is a presidentially-appointed member of the J. William Fulbright Foreign Scholarship Board.